alaTest on kerännyt ja analysoinut 1545 arvostelut lehdistä ja verkkosivustoilta. The lightweight, ergonomic HP X7000 Wi-Fi Touch Mouse transmits a pairing signal through a wireless network to liberate precious USB ports for other peripherals. The X7000's ergonomic shape alienates left-handed users, the oversensitive touch scroll pad doesn't compare to the tactility of a classic scroll wheel, and the driver software lacks tools to reroute the functions of the mouse buttons. The HP X7000 Wi-Fi Touch Mouse frees up USB ports by pairing through a wireless adapter, but its hypersensitive touch dial and accident-prone design make it frustrating to use. 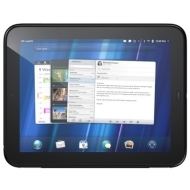 The HP TouchPad uses Palm's unique WebOS interface and delivers Adobe Flash-enabled Web browsing, Beats audio enhancement, and impressive compatibility with third-party calendar, messaging, and e-mail services. The TouchPad has a thick, smudgy design, offers no rear camera or HD video capture, includes a limited app selection, and its unique cards system of multitasking isn't as fully utilized as it could be. The TouchPad would have made a great competitor for the original iPad, but its design, features, and speed put it behind today's crop of tablet heavyweights. HP webOS finally arrives on tablets, but how does it stand up to the competition? When HP bought Palm, it was widely considered to have been mostly fuelled by the desire to acquire the webOS operating system.